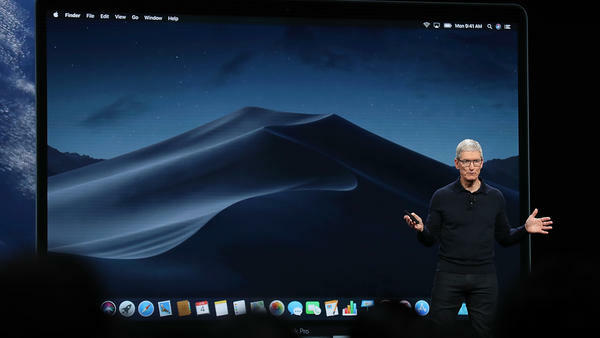 Apple CEO Tim Cook speaks Monday during the 2018 Apple Worldwide Developer Conference at the San Jose Convention Center. Steve Inskeep: I want to begin with some news that you made — and by the time people will hear this interview we will have explained essentially what it was — having to do with screen time and parental controls. I want to get at the thinking behind that: What, if anything, bothers you about the amount of time people are spending on your phones? Apple CEO Tim Cook: If you back up and think about what we've — what we're about — we've never been about maximizing usage of our devices. It's never been a focus of ours. What we've always try to do is infuse humanity into our products, and give you something that amplifies something you want to do, or enables you to create something that you couldn't create otherwise. And it — sort of to make your difference in the world. And so that's where we've always been about. There's clearly users out there that are worried about the amount of time they're spending, or the amount of distraction or interruptions that they get. So we thought really deeply about this and, sort of our latest is what you call a "Screen Time." But we've done many things over the years; this is sort of the latest thing that we're doing. And essentially it's about giving you insight, so you know how much time you're spending, where you're spending it, how many times per hour you're picking up a device, how many notifications you get, who's sending those to you. And so — because we want to give the power to the user. Right now we can all almost kid ourselves a bit about how much time we're spending, and whether we're distracted or not. There's nothing like getting a report of facts to see what is happening to you. And parents are obviously very interested in having this for their kids as well. We've been doing things for parental control since the creation of the App Store, but this gives parents another huge tool to use. I want to ask about your thinking though because you could say "I'm responding to demand and there's some shareholders that wanted this," but are you actually bothered, are you actually concerned by the possibility that what you argue is a social good could be a social detriment? I think there are cases in life where anything good, used to the extreme, becomes not good. And so, just like — you know, I can eat healthy food all day, but if I eat too much it's no longer good anymore. And so I think just like that, you can depend on your device so much, and spend so much time on certain apps, or pick up your phone so many times during the day that this is no longer good. But this was literally your ambition as a company, right? To make sure that people use everything through their phone. But you maximize the number of things you can do with it, that's for sure. We do that, yes, because we want it to be an incredible device for you. And so, you know, we've provided a way for — we have health information on it, financial information, you can pay with it. And so all these things are great conveniences of life. They change your daily life in a great way. But if you're getting bombarded by notifications all day long, you — that's probably a use of the system that might not be so good anymore. Is there a little bit of conflict that you have to think about? Because you are offering people ways to limit their screen time, while speaking to this giant conference of thousands of people, developers who are in business to go sell products through your app store that would encourage people to use the phone more. No I don't see it as that, because we always put the user at the center. And so the user is our focus. And so our question is always, what is in their best interest? How can we serve them best? And I think arguably, just like the watch has given us a way to measure your exercise time in a day, your activity in a day, the number of times you're standing — all of these things have presented the the user with powerful information that they didn't have before. I mean I know from my own experience, you can kind of kid yourself that you've done something really well, and then you look at the facts and they're a bit different. And so what this is about is taking the power from the institutions and giving it to people. And Apple has always been about that. Do you agree with people who use the word "addiction?" Talk about addiction to smartphones? I'm not a clinician and so, uh, I don't know. What I do know is, that you can use something too much. And I know some users are — I don't know really what percentage, but I know some users are concerned about it. And I'm concerned about it. And so I think that both the reporting and being able to put limits on yourself — you can say I'm going to budget, just like you budget for financially how much money you're going to spend in a month — you can budget how much in a day you want to spend online, or in a certain app. There might be some apps you don't want to put a limit on because it's inherently good. Maybe it's — maybe it's books, and you want to read and so forth. And so this is a very personal decision. It's not one that a company — Apple or anyone — should be making for you on your behalf. But what we want to do is provide you great tools so you can make a judgment for yourself. You also made some news by announcing some changes to your web browser and elsewhere, which you say will make it more difficult for outside parties to track what you do online, to track your data. Are you deliberately making your platforms more hostile for companies that do business like Facebook, which was mentioned in your presentation? We're not targeting any single company. We are targeting a practice of people collecting information without the vast majority of users knowing that it's being collected. We think that when a person leaves one Web site, and goes to another and another and another, they do not have a reasonable expectation that that original Web site is still following their every move. And so we want to do what we can do there to try to prevent that. But we're not taking the ability of — if somebody, you know, is on the NPR app, we think it's fine and rational that the person, that NPR knows that person is there and knows something about, them assuming the user has elected to share that. What we don't think is --when you leave there, we don't think the surveillance engine should stay. And so we are stepping in and trying to do something there — again, on behalf of the user, giving the power to the user. As Craig showed in the demo, you can perfectly say, yes, send the information to whoever it is. I want people to know that you have emphasized that your company does not intend to make money off of data mining, does not intend to make money off of advertising; you make money by selling hardware. But you're addressing a developers conference here, where there's a lot of app developers who may well rely on advertising, who may well rely on data. Well let me correct something you said there: We don't believe there's anything wrong with digital advertising. It's a key part of people's business models, and we think it's perfectly fine. It's the crafting of a detailed profile and tracking you in places where you don't reasonably expect to be tracked, and companies gathering information well beyond what you would have voluntarily shared if you knew what they were doing — that's what we have a problem with. We have no issue at all with digital advertising. I think it's — it can be a very good model. You don't agree with some critics who are saying that that is distorting the information that people receive, that is creating the wrong incentives for companies that produce content? Yeah, but it's different online. And the incentives become different online because you need to get people to click, and click again, and click again. Well it's not different inherently; it's different because the society has made it different. And this I think we have to take another look at. The last thing that as a user we probably want is to take part in a clickbait scenario. Right? I don't really think the vast majority of people want to do that, and so hopefully our moves today and our past moves will will help the situation. Is there a better business model than the business model that lots of companies are using? Facebook being the most famous example, but there must be thousands of others that do approximately the same thing. Again on the digital, we have no issue with digital advertising. But data mining, you have, or excessive data tracking, you do have an issue. It's the collection of information beyond what the person is fully and completely aware is taking place, and the building of this detailed profile. I think — I think that steps over a boundary. You started this conference by saying that your goal, and your company's goal, is to make the world a better place, which is something I'm sure you've said before. As you think about the tech industry and your long experience in it, are there ways that the tech industry is making the world less equal? Making people less equal? I think that the society in general, and certainly in the United States but outside of the United States as well, this — the inequality issue is growing in almost every country. And we've taken a deep look at ourselves and said, What can we do to try to make that better? And our conclusion was, for us, that we could make a major contribution in education. We believe that America needs huge investments in education and infrastructure. And so on the education — this is one we have deep experience in. And we think a core part of that is, if coding were taught in every school, this would be a really great thing. Because coding is not just for software engineers — the truth is software is touching us all, every minute of the day. And so everyone should have a view of what's possible. And you really want to introduce kids to that, you know, as early as possible, and as — and in, you know, should have progression through grades as you do mathematics and so forth. And so we prepared a curriculum, and made it free for all of education — we've given it away. And — in addition to some of our philanthropic work with different underprivileged schools. Well that's trying to mitigate a problem. But I'm asking if you feel that on some level the tech industry has become part of the problem. You're creating so much wealth, you're creating enormous prosperity for a lot of people, but we're here in Silicon Valley where home prices for example are so expensive that the average person couldn't afford to live here. You have a tendency that you could trace of increasing the divide between people. I think — I think to some degree, I believe you're mixing things. There is — there's a huge issue in the Valley with affordable housing. And clearly something needs to be done about it. Yeah but it's a great example — and it affects our employees as well, by the way. And, and so — but I don't see a cause and effect there. Has the growth in tech amplified it? Yes, I think that's — I think that's accurate to say. But basically you have a mismatch between the investment in infrastructure and the desire for jobs. And much has to be sorted out there. You said that the growth in tech has amplified that particular problem. Has the growth in tech amplified inequality broadly across society? I do — I think that, no not really. I think that tech affects every industry at this point. And so, I get your question as a tech industry, but tech affects all of the — all of the world and every industry in the world at this point, from medical to industrial and so forth. And so tech has brought a level of productivity. And what I do believe has happened — I don't believe this is a tech-only thing — is that globalization that's happened over the last few decades has brought about winners and losers. Not just globalization of tech, but globalization in general. And I think what we haven't done well as a society is say, let's keep the good, because that's great, and let's figure out what we can do to change the part that's not working, and how we address that. And our huge approach there is on education. This is the reason we're out in community colleges and so forth, and reaching different demographics than we would normally reach through for your schools. Define the problem, then. What's not working in education? I think that — I think that in a lot of ways there's a disconnect between the requirements and great demand for skills in the workplace, and the skills and lessons that are being taught in education. Coding is an example of this, and that I've spoken about. And so I think that's part of it. I also think that because tech is so integral — not only to this industry but to the world — you want to have kids having access to tech in all neighborhoods; not just those lucky enough and fortunate enough to be born in the right zip code. And so this requires bold investment. And to me it is — it is job one. Even with the wealth that is at the command of this company, isn't that a problem you can only work around the edges on? You need a different governmental approach to education, if your diagnosis of education is correct. The way that I look at Apple's role is that we try to be the ripple in the pond, and — because we know, yes, we're not a small company anymore, but in the scheme of things, as you point out, we are small. And so what we try to do is do things that get enough visibility that some other people want to do it too. And some more people, and more people and more people. And we try to find ways that we can, you know, work with someone else or work with government, or whatever, to try to make the effort larger than we could ever do on our own. And so that's how — that's how we look at it. Is it getting harder to follow the values that are important to you, as an executive, when doing business in China? No. No, not at all. The — we don't — we never move off of our values. Never. Our values are very clear. We — I think everybody in every country in the world knows what they are. That doesn't mean that we're fortunate enough, or that it's realistic, that every country have the same laws. And so what we don't do — and I know sometimes people want, or some people want us to do this, is — we don't believe the way you create change is to stand on the sideline and yell. We believe that engagement is the right way. And so when we go into countries our litmus test is not, they must agree with everything that we agree with. If we did, there would be states that we weren't in, right? It wouldn't wouldn't just be countries. And so we'd like to go in a place and kind of show what we're about, and try to figure out ways that we can create change, and show how we treat each other and so forth. And we think that's the greatest way to to create change. Was it a difficult call to comply with the Chinese demand that Chinese customers' iCloud data be stored on servers in China, where it sounds like the Chinese government might have an easier time accessing it sometime? Well that's a faulty assumption that you're making. The same encryption that Apple uses in the United States, and in the United Kingdom, and in France and in the UAE, is the same encryption we use in China. And you know, iMessage is encrypted end-to-end there and encrypted end-to-end here. And they never ask us to break that. What they've asked, and several other countries are ruminating about, is they ask that their citizens' data be stored within the country. But I would separate for a minute that that equals access. I don't buy that at all. Cryptographic keys are also supposed to be kept in the country, is that correct? In the famous terrorism case, right? It's not the assumption that I make it all. I think China has identified cloud services as something very strategic, and they want to have Chinese companies involved — or running or so forth --the cloud services in that country. And so you can't, by law, you can't go into China as a foreign company — not just an American company but a foreign company of any country — and operate a cloud service. Oh, so you view that as just part of China's continuing effort to make sure that there are local partners in whoever's doing business in China. I view it as an economic and sort of technology and innovation kind of focus, not a focus on unusual access. And one other question along those lines: When China asks Apple to remove or delete an app from the App Store because it includes a VPN — a virtual private network which allows people to conceal their communications — is it bothersome to you to comply with that? Yes, it absolutely is. It's something that we didn't want to do. Unfortunately, unlike the U.S. where we felt we had the law on our side in the famous case where the FBI sued us, we did not have the law on our side in China. The law is pretty clear that you have to have a license in China to operate a VPN service. And so there actually are still VPN apps on the store. Less than there were, because there were a set of companies that didn't get a license. I see. Given the difference in the laws, are there requests from Chinese law enforcement that you would grant, that you would resist if they were made by U.S. law enforcement? No, and frankly we couldn't. So let's go back to the basics here: The things that law enforcement is generally interested in are messages, right? Messages for us are end-to-end encrypted. Apple doesn't know what you're saying, we don't have a record of it, we don't store it. We don't have a key to it, right? The key is with the sender and the receiver. And you want to keep saying that to Chinese authorities or anybody in the world. That you can't actually answer their request. Yeah. We can't give messages; we don't have it. We don't have it. So — and by the way, we did not do that because of government, or law enforcement. We didn't do that, e did it because we know that if there is a back door, and that nefarious things can happen, and it can be a public safety issue. You know, it's not a matter of Apple is presenting itself as some rebel company against the government; it has nothing to do with that. What was your recent meeting like with President Trump? It was a — it was a meeting about trade and immigration and some of the topics that we feel very passionate on. And I felt he very much listened to the point of view. Trade and immigration: Let's talk about trade first. There seems to be a trade war heating up once again, if that's the right phrase. The trade war was off, and now it seems to be back on. What does that — what do the administration's trade policies regarding China mean for Apple? Well there's probably a better person to ask that than me about the current status of negotiations. I have no idea. What's at stake for your company? If I zoom out out and talk about trade in general, my view is that countries that have a significant level of openness — and I mean that in terms of immigration and trade as an example — are the companies that thrive over time. And countries that are more closed do not. And so you can look back in history and see this repeating itself again and again and again. And so that's how I feel. Now I do believe, as I mentioned before in here, that globalization has created a set of issues. And the world wasn't — none of us were as good as we should have been, and as fast as we should have been in saying "these are the issues and let's figure out what to do about them." And so I think that's key. But that, to me, doesn't cut out trade. Trade brings people closer together. If I can do some business with you, I'm going to find out some things about you and we're going to get along a lot better. And I think that's true about countries as well, you know? It's like the — you know, even — I do business a lot of small businesses in town; you get to know them, you build a relationship. It's the same thing for trade between countries. And so I think it helps a set of broader issues when there's trade going on. Did you talk to the president on that level? About the philosophical benefits of openness? I am — you know I (chuckles) — I am really straightforward kind of guy. And I don't have a different view in some person's office than I have in front of you. I'm the same old person. Take it or leave it, but that's who I am. And so — you know, that's who I am. Did you tell him on China specifically, a trade war with China is going to cost American jobs? Well just tell me, does a trade war with China cost Apple jobs? Uh, I don't think that Apple is going to get caught up in a tariff there. But I don't know this, but I don't think so because if we were it would hurt the U.S. And so it doesn't make sense to do, from that point of view. You know, I don't — when countries have these huge relationships, there is some complexity by its nature, and things that have to be worked out. And so I think the fact that there is a focus on the trade relationship is perfectly fine and legitimate. There should be a focus on trade, with a whole variety of countries as a part of the relationship. But in terms of throttling it, or tariffs, which result — which the end result would be a tax on the U.S. consumer? I don't think this is good. And I think we're in a period of time right now — I mean we the United States — that our economy is doing well. We're growing well, the unemployment rates are low. These things are really important. It gives us a chance to focus on a lot of these issues that — inequality-type of issues, and where the benefits of this have not been enjoyed by everyone. And I think my own belief is that's where a huge amount of our focus should be. One other thing I want to ask about, because we're at this conference where you're discussing augmented reality, you're discussing machine learning that leads over to the phrase "artificial intelligence." Are you, in any way, as scared by the prospects of AI getting out of control as, say, Elon Musk of Tesla is? Well I can't attest to what Elon thinks, and so forth, but here's what I think — and I've said this before and I generally mean it — is, I don't really worry about machines thinking like people; I worry about people thinking like machines. Because it's the absence of humanity in products that create the issue. It's the absence of deep thought about, you know, what products can do, what they can be used for, the good and the bad. And that's what I worry about that. Assuming the American is still getting paid for the hour, I suppose. Well, of course. Because it's a productivity pickup, right? And so I think if that's where we wind up, that's pretty good. That's pretty good. People are working really hard in this country, and really long hours, and so forth. And so I think, you know, that'd be a good thing. And the science fiction scenario of people having to go to war against machines? Machines against people? They don't seem impressive to you at all. It is not something that I'm focused on, and I think the vast majority of people, this probably shouldn't be the top thing on their agenda. Tim Cook, thanks very much. I really enjoyed that conversation. Thanks for putting up with it. Is it — yeah, what do you got? Oh, I forgot about that, yeah. All the — I'm wondering, was Apple taking advantage of that? Were they able to collect extra data because Facebook allowed this? No. The things mentioned in The Times article about relationship statuses and all these kinds of stuff, this is so foreign to us, and not data that we have ever received at all or requested — zero. What we did was we integrated the ability to share in the operating system — make it simple to share a photo and that sort of thing. So it's a convenience for the user, not — we weren't in the data business. We've never been in the data business. But is the story correct that Facebook was sending that data to you? The data — all this, the stuff that's mentioned in the article about relationship status and all this kind of stuff? No. This is simply you were making arrangements to make it easier for Facebook to operate on your platforms, is that a layman's way to put this? We were making it more convenient for the user to be able to share photos to their Facebook feeds and this sort of thing. Is the story wrong, then? No, I wouldn't say that because I don't know about — there were 60 people, or 60 companies referenced, and I don't know about 59 of them. I only know about one. And so that's the only one I'm speaking about.